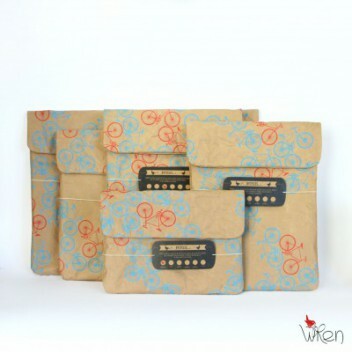 WREN makes lifestyle accessories out of recycled paper. Our paper usage is innovative that makes our products like no other. We fuse and coat the paper so that it is durable, water resistant and retains the paper handle. We are committed to sustainable methods and have a unique approach to production. Each member of the production team is a proud entrepreneur in their own right, working independently and in close collaboration with the company. WREN offers over 100 products (from backpacks to laptop covers) that combine simplicity of design with eco-friendly manufacturing methods to produce eye-catching accessories.